2011 Quantya MMX. Picture credits - Quantya. Submit more pictures. 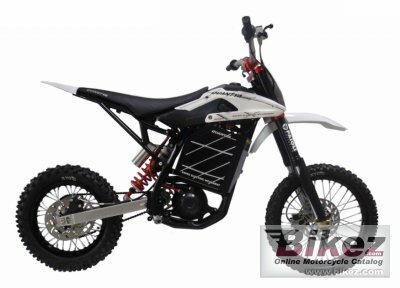 The Quantya Junior MMX is an ideal introduction to the World of motocross. It is almost as powerful and just as fun as the original Evo1 Track, however is has been modified to suit smaller riders. A lower saddle height, a shorter wheelbase, and smaller wheels combined with a slightly lower power output make the bike more user friendly and perfect for smaller riders. Engine details: Axial Gap DC brush motor. Comments: 52V 40Ah Lithium Polymer battery. Full charge time: Normal 2 hours/Fast 1 hours. Range: 40km/25 miles. Ask questions Join the 11 Quantya MMX discussion group or the general Quantya discussion group. Get a list of related motorbikes before you buy this Quantya. Inspect technical data. Look at photos. Read the riders' comments at the bike's discussion group. And check out the moped's reliability, repair costs, etc. Show any 2011 Quantya MMX for sale on our Bikez.biz Motorcycle Classifieds. You can also sign up for e-mail notification when such mopeds are advertised in the future. And advertise your old MC for sale. Our efficient ads are free. You are also welcome to read and submit motorcycle reviews.